Matt C: By Jove! - (as they exclaimed in the olden days, possibly) - that's a heck of a lot of comics coming our way this Wednesday. Not only do we have the finale of The Wake and the reappearance of Hawkeye (enjoy it while it lasts, folks! ), we also get the return of the most excellent Black Science from Rick Remender and Image. 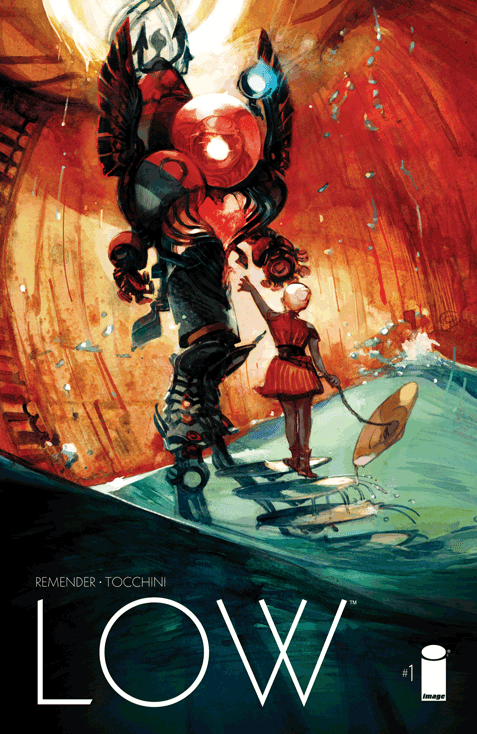 And, if that wasn't enough, we've got another new creator-owned Remender title coming from the same publisher: Low #1. Described as "an aquatic sci-fi/fantasy tale" where humanity has retreated to the depths of the oceans to escape an irradiated surface, this sounds like another blinding concept from the writer to sit alongside Deadly Class and the aforementioned Black Science. And continuing on the subject of Remender, Uncanny Avengers #22 sees him wrap up the story that he's been working on for a long time (even longer if you count Uncanny X-Force), as Kang's endgame is revealed. That's a lot of excitement on the agenda, and when you add in C.O.W.L. #3, Avengers #33, The Massive #25, New Avengers #21, Mercenary Sea #6, Avengers World #10 (yes, that's the four main Avengers books in one week!! ), Outcast #2... well, this has the potential to be one of the best weeks of comics in 2014. Coming in from the leftfield though is Chew: Agent Warrior Poyo, a one-shot that could be a real contender. I may have grown a little lukewarm on Chew recently (although I still enjoy it) but Chew: Secret Agent Poyo from a couple of years back was a glorious explosion of hilarious lunacy, and if this new issue comes close to that it just might beat the competition to take the week. Never count out Poyo! Stewart R: It looks like this is one of those weeks where Matt and my pull-lists are not too dissimilar to each other. Mine is of course weighing heavy with the multitude of Rick Remender books on offer this week with Uncanny Avengers, Black Science and the brand spankers new Low #1 all making an appearance. Aside from a brief stint working together on an arc of Uncanny X-Force, I've only had the pleasure of seeing Remender and Greg Tocchini team up once before and that was for the rather splendid Last Days Of American Crime miniseries, and if they manage to hit that level of quality again then we're on to a good thing. I'm chomping at the bit to get hold of East of West #14 tomorrow following the tantalising last panel of #13 with war looming large on the horizon and the apocalypse seemingly not far behind. I can also see things getting worse before they get better for Wren on her journey to restart a dying clockwork sun in Ian Edginton's Brass Sun #3 and I can't wait to see what crazy and wondrous sights he and Culbard bring to the page next.